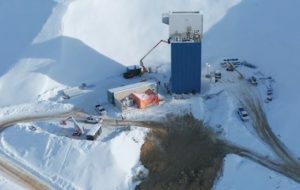 Eagle Gold Mine construction underway in the Yukon. Source: Victoria Gold Corp.
Victoria Gold Corp. [VIT-TSXV] needs another $25 million to complete construction at the Eagle gold mine project in the Canadian Yukon. The Eagle Mine is part of the larger Dublin Gulch Project and is expected to rank as the largest hard rock gold mine in the Yukon’s history. Victoria Gold shares fell 1.96% or $0.01 to 50 cents Tuesday February 26 to trade in a 52-week range of 55 cents and 30 cents. The Eagle Gold Project is located in central Yukon, 375 km north of Whitehorse, and 85 km north of Mayo. The mine is expected to produce 200,000 ounces of gold annually at an operating cost of approximately US$550/oz using heap leach processing methods. Full construction commenced on March 15, 2018, with completion and first gold pour scheduled for September, one month ahead of previous estimate. A revised construction capital estimate was finalized at $442 million, the company said in a May 24, 2018 update. However, the construction capital has risen by approximately 10% to $487 million due to additional earthworks, following unexpected geotechnical conditions. The company said it is working with its funding partners to ensure the mine is fully financed through construction to positive cash flow. Back in March 2018, Victoria Gold announced a $500 million financing package that the company said would enable it to continue with construction at the Eagle gold project. Victoria said at the time is had signed agreements with Orion Mine Finance, Osisko Gold Royalties Ltd. [OR-TSX, NYSE], and Caterpillar Financial Services Ltd. in relation to the financing package. Under the agreement, Osisko Gold Royalties signed a term sheet with Victoria Gold to acquire a 5% net smelter return royalty for $98 million on the Dublin Gulch property. As part of the funding requirement, Victoria said it intends to complete a non-brokered flow-through financing. The offering will include Canadian development expenses (CDE) and flow-through shares. Gross proceeds of up to $15 million will be used to incur CDE qualifying expenditures for the purposes of the Income Tax Act (Canada). All securities issued under the offering will be the subject of a four-month hold period. Dublin Gulch hosts the Eagle Gold Project, a shovel ready gold project which hosts 2.7 million ounces of proven and probable gold reserves contained in 123 million tonnes of ore with a grade of 0.67 g/t gold as outlined in a NI 43-101 compliant feasibility study. With the acceleration of the construction schedule, over 3 million tonnes of ore are expected to be delivered to the leach pad by the end of 2019.